Tetra has expanded its popular problem-solving range for aquariums with its Phosphate Minus and pH/KH Minus solutions. Dedicated to making fishkeeping increasingly easy, the new launches provide fishkeepers with reliable and straightforward options to combat common issues for healthy waters where plants and fish can thrive. Aquarium life relies on a balance of various water parameters, and phosphate concentration is one of them. Phosphate is a plant nutrient that arises naturally over time from contributing factors such as fish waste, food residues, and dead plants. However, a high phosphate concentration can stem plant growth and lead to an increase in algae growth. Providing a fast-acting solution, Tetra PhosphateMinus naturally reduces excessively high levels of phosphate in aquariums and unlike some competitor products, does so without clouding up the aquarium water or leaving any residue on the ground. What’s more, Tetra PhosphateMinus is even suitable for soft water so there’s no need to test carbonate hardness before using. For those looking to also regulate carbonate hardness levels, Tetra pH/KH Minus provides a controlled reduction of this, alongside pH value, leading to improved plant growth from the release of CO2. Tetra PhosphateMinus and Tetra pH/KH Minus are suitable for all fresh water and marine aquariums and are available now in 100ml bottles with an RRP of £4.85 and £4.30, respectively. Award-winning aquatic nutrition specialist, World Feeds, has launched a new flake food for Rift Valley cichlids. Following on from the success of Vitalis Rift Lake Green Cichlid Pellets, this new food is also formulated for the herbivorous cichlid species of the African rift lakes, including Tropheus and many mbuna species. The new Vitalis Rift Lake Green Flakes boast the same tailored, spirulina rich formulation as the pellets, but they are designed to provide a method of feeding small and juvenile cichlids with lower protein requirements. Importantly, the latest cichlid flakes have the added versatility that they can be left large for feeding bigger fish when required. The balanced flakes also deliver key nutrients from a blend of high quality algae, and incorporate natural pigments to achieve healthy fish colouration. Available in three pot sizes: 30g, 90g and 200g. More info: vitalisaquatic.uk or worldfeeds.uk. Fancy one of the best jobs in fishkeeping? Come and work with us! Practical Fishkeeping is an essential read for anyone with an interest in fish, whether tropical, coldwater, marine or pond. It’s the first port of call for in-depth information on the fish to choose and how to care for them, along with inspirational ideas, step by step guides, product reviews and expert advice. Provide lively and informative articles for our knowledgeable and passionate audience of fishkeepers. Inspire readers to improve and extend their skills with clear and concise step by step features. Have a good understanding of social media. A knowledge of fish and fishkeeping would also be an advantage. The role is full-time and based at Bauer Magazine Media, Media House, Peterborough. Closing date: December 15th 2017. 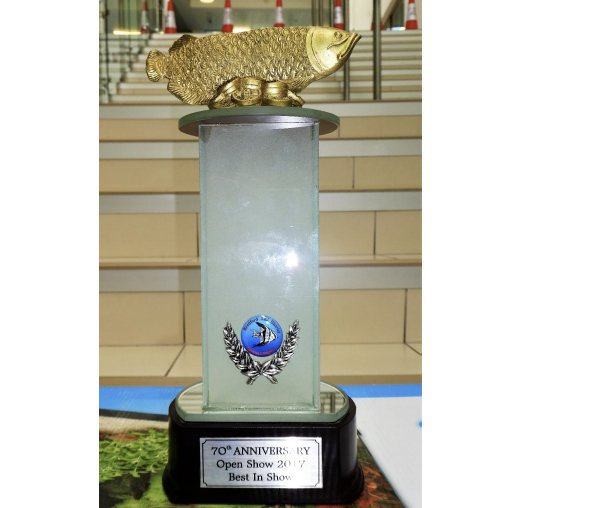 To celebrate its 70th year, Bradford & District Aquarists’ Society designed this special trophy for the Best in Show at its event on November 12. It wasn’t a Golden Arowana that won at the Open Show but a Southeast serpent loach, Serpenticobitis octozona, owned by the Brown family of Preston AS. Held on Remembrance Sunday, at the Bradford Academy, there were 242 entries in the 37 Classes. The winning loach received 86.6 points from the three Yorkshire Association of Aquarist Society judges via YAAS rules. The next important award at this event is in the Pairs Classes. The Best Exhibit in this class was a pair of North American Rainbow shiners, Notropis chrosomus, with 86 points, belonging to John Hetherington of STAMPS (South Tyneside Aquatic Marine & Pondkeepers Society). Again, a special 70th anniversary trophy was awarded. The Open Show also included an Auction with over 100 visitors bidding for the 22 lots of aquatic items with auctioneer Steve Jones of YAAS. As part of the celebrations there was a projection display of the members, their fish and past shows, especially the aquatic tableaux that used to be built in past exhibitions. This was shown on a screen all day long. It was interesting to see members looking at this screen, reminiscing and even taking photos (on their iPhones) of ancient photos that were once slides, now digitised and displayed. Not all 70 years though — that was before technology! It’s time to reveal the winners in this year’s PFK Readers’ Poll. So, which were your top shops in 2017? Our 2017 Readers’ Poll to find your favourite aquatic shops saw a record number of votes — almost 30% up on 2016. And it has to be said that there were some surprises this year too. Lincs Aquatics, Alford, Lincs. (pictured above). Octopus 8 Aquatics, Brough, East Yorkshire (pictured above). Runner up: Wharf Aquatics, Pinxton, Notts. Star Fisheries in Surrey is holding its last Open Day of 2017 on Sunday, November 26, with an exciting collection of fish for sale. "Many new fish from around the world have arrived in the last few weeks giving you the opportunity of purchasing some of the very best fancy goldfish outside Asia," says Star Fisheries' Andy Green. "From the small sizes right the way through to large jumbo sizes, we have some really spectacular fish for sale so if you are looking for that special fish or fishes I am sure you will find something of interest." Andy adds that there will be no standard grade website fish offered for sale at the Open Day — all the fish will be higher grade fish. You can still order the standard grade fishes online. Star Fisheries will be open on the day from 10am–3pm. There is plenty of free parking available. Tel. 0208 915 0455 or 0208 661 8789. December issue of Practical Fishkeeping on sale now! Did you know that a Guppy is more closely related to humans than it is to a shark? This is just one of the 101 amazing facts about fish that you'll find in our special feature in this month's issue of PFK! The December issue also brings you some fabulous ideas for winter breeding projects. There's a spotlight on the gloriously laid-back Mesonauta cichlids — beautiful, medium sized fish that won't eat your Neons, unlike some of their relatives. You can also discover the tiny Jae barb and find out the results of a study on the effects of bare tanks on Zebra danios. We have three aquascaping ideas to inspire you and our recent travels turn up four rarities on the fish front that had the PFK staff doing backflips! If you're looking for something striking but undemanding for your reef tank, check out the incredible Doughnut corals, or meet the marines from mucky homes — but don't worry, you won't have to replicate their habitat to keep them! All this and much more in the December issue of PFK — on sale now! This year's Supreme Champion: Allan Finnegan's Aulonocara maylandi. The weekend of October 7–8 of saw the UK’s penultimate Festival of Fishkeeping at Hounslow, Middlesex. The show, directed annually by the Federation of British Aquarist societies, and now into its 31st consecutive year, acts as host to various members of numerous clubs, who come together to display the best of the best of UK show fish. Over two days, contest categories included the British Open, the Diamond Class Final, the Supreme Breeders Final, the Supreme Pairs final, and the crème-de-la-crème, the Supreme Championship Final. Winning this last category is ‘the’ coveted position for fish showers, and this year the prize went to Allan Finnegan for an outstanding Aulonocara maylandi. For those unfamiliar with fish showing, the initial layout would come as a surprise. After years of associating fish care with large, filtered aquaria, the sight of numerous small display aquaria, completely barren and without any life support equipment can be unsettling to those outside of the ‘scene’. As always, it requires the newcomer to actually look at the fish on display to see that they are, contrary to what might be expected, far from showing any symptoms of stress. Your mind is put at some ease when you speak to the showers themselves and get a feel for the love and effort that has gone into conditioning the fish throughout the year. Most of those you meet at this level have admirable fish houses, and a significant amount of time and effort is put in to their livestock – the shows are a way of showing off these efforts. For those looking to pick up outrageous bargains, many of the pristine show fish were sold off after final judging on the Sunday afternoon. Specimens like the Sawbwa resplendens Asian Rummynose seen here were snapped up for a mere £3 each. For collectors of unusual fish, Sunday afternoon became quite a harvest. As well as the traditional shows, the Festival hosted other attractions over the weekend. Set on an urban farm, the site is home to various semi-exotic animals and visitors were treated to unusual, non-fishy spectacles like owl flying. Reptiles were also displayed, for the more adventurous folks to investigate. From the perspective of those attendees with children, arts and crafts and play zones were present. This year also saw the first FBAS Betta Show, which was notably the largest (by numbers) of any category. Combined with the Betta displays provided on the day by LJB Aquatics, 2017 constituted what was easily the most Betta splendens oriented show to date. Flowerhorns played a large part of displays and sales on the day, again hosted by LJB, but for folks looking to buy, plenty was available. Availability of fish played a large part of the weekend, with surplus home-bred fish providing some serious bargains. High-tier Potamotrygon supplied by Freshwater Stingrays were a particular draw, in both buyers and casual admirers. All manner of fishkeeping paraphernalia, from mugs to aquarium filtration all made an appearance. Supporting companies included Rolf C Hagen, Simply Koi and Fish Science, with staff on hand to offer technical advice to hobbyists. Sadly, absent from the year’s event were one of the Koi displayers (and subsequently his Koi) as well as Discus (usually a firm favourite) so the event was a little thinly spread compared to previous years. To repeat, this show is the penultimate Festival of Fishkeeping, so the last chance to attend one of these historic occasions and see what the fuss is about will be in Autumn 2018. Allan Finnegan (left) collects one of his many awards at this year's Festival. A special weekend to celebrate the seventh anniversary of Fishkeeper Scotland will be taking place from November 4–5, 2017 across all 14 stores. There will be very special offers in-store across a wide range of products, including discounts on fish and aquariums. There will also be goody bags while stocks last, raffle prizes, colouring-in competitions and cake for all visitors. Proceeds of the charity raffles will be in aid of the Scottish SPCA, who have been personally invited to all the stores to fundraise and to help promote responsible pet ownership and animal welfare. Fishkeeper Scotland raised over £3000 last year in aid of the Scottish SPCA at its new store openings. Fishkeeper Scotland now has 14 stores across the country, after taking over and refurbishing many Dobbies concessionary departments. The stores have a new look with thousands of tropical, marine, coldwater and pond fish. There is also a wide range of aquarium plants, marine invertebrates and corals. National Support Manager Niall Simpson said: "It's amazing to be celebrating the seventh anniversary of Fishkeeper Scotland. It's great to see all 14 of our stores now officially open. We hope everyone can come along to help us celebrate the occasion by benefiting from our special offers and raise funds for Scottish SPCA to help promote responsible pet ownership." EHEIM Proxima classicLED aquariums and cabinets. EHEIM has added an LED alternative to its Proxima range of aquariums. The new classicLED set is equipped with two energy saving EHEIM classicLED strips instead of fluorescent tubes. The elegant design of the Proxima range is ideal for the modern environment. The cabinet doors have no handles, giving them a classic, clean finish, and are available in high gloss white, mocha or the new ‘urban’ concrete (soft grey) look. Tank volume 175, 250 and 325 l.
50cm depth — ideal for aquascaping. Clean lines with an elegant mix of glass and brushed aluminium (light frame and bottom trim). Easy to use cover with sliding black glass panes. Two integrated, movable classicLED strips (daylight). 500 Kelvin, colour similar to daylight. Optimum illumination, radiation (light) angle 120°. Water resistant lights (IP 67) with safety power supply and Y distributor. High energy efficiency; average durability of the LED lamp min. 35000 hours. The aquarium and lights available separately (without cabinet). Cabinets also available separately (for all models except Proxima reef). Airport police in Manaus, Brazil, have seized a huge number of Amazonian fish hidden inside three large suitcases. A total of 672 fish were seized on October 14. There were seven species in all — a record number of species — including one threatened with extinction and two undescribed species. They had been packed inside cut-off plastic bottles and bags. Many had bruising and some — including two stingrays — died. The fish were taken to the National Research Institute of the Amazon (INPA) for unpacking, and then they were transferred into larger tanks (scroll down for video). They included more than 300 Zebra plecs, Hypancistrus zebra, which are endemic to a small stretch of the Xingu River and under increasing threat of extinction due to the construction of the Belo Monte dam. Jansen Zuanon of the National Research Institute of the Amazon (INPA) said that the situation regarding the Zebra plec is particularly worrying. "The Belo Monte destroyed the main habitat of the species, and this clandestine trade increases the pressure of what is left of this population,” Zuanon told Folha de S.Paulo. He added that an agreement with Colombia to ban the trade of this species would reduce smuggling, along with installation of inspection points at smaller airports in the region. Two people were arrested as they attempted to travel to the town of Tabatinga, on the triple border with Peru and Colombia. It’s thought that from there the fish would have been taken over the border into Colombia — a popular smuggling route for Brazilian fish — from where they were destined for the aquarium trade. The pair — who were described to have been acting as ‘mules’ in a similar way to drug those used by drug smugglers — were charged with environmental crime and attempted smuggling. On 4th and 5th November, the largest and most loved pet event in the UK, The National Pet Show, will take place at the NEC in Birmingham bringing together animal lovers from across the UK. As the official sponsor of the Kids Zone, Tetra will host a range of activity to inspire and engage excited young fishkeepers to learn more about the fascinating world of fishkeeping including fish themed arts and crafts, face painting, competitions, and a cool treasure hunt adventure! For the more experienced fishkeepers there is also the opportunity to gain in-depth information on common problems such as algae and fish disease from Tetra’s on-stand experts. If that wasn’t enough, at the centre of the Kids Zone Noel’s Ark will bring a variety of animals from hens, owls, mini beasts and dogs for children to enjoy whilst budding vets can tune into inspirational talks from Supervets’ own Professional Noel Fitzpatrick. Over the course of the weekend, Tetra will showcase its range of aquariums including children’s themed Minions and My First Aquariums which offer families everything they need to kickstart their new adventure, along with its premium range of food and core products. During the show, Tetra will be present at stand A226, next to the Kids Zone. For those looking to attend, Tetra is happy to offer 25% off the advanced online ticket price for adult and children. Just enter the promotional code ‘TETRA’ using this link. For more information about Tetra, visit the website or join the conversation with Tetra UK on Facebook. Catch The Aquascaper on tour! Top UK aquascaper and PFK contributor, George Farmer, is on tour at various shops and shows around the UK, putting together some amazing 'scapes live before your very eyes. Sunday, November 19 to Friday, November 24: Poland, Hungary, Czech Republic, with Adam Paszczela. The Nationwide Goldfish Societies UK held their final Open Show for this year in Telford’s Village Hall on September 30, 2017. The four clubs, Northern Goldfish & Pondkeepers Society, North East Goldfish Society, Association of Midland Goldfish Keepers, and the Bristol Aquarist Society, competed to find the Best in Show and Best Exhibit for this year. The winning fish – both Best in Show and the Best Exhibit - was owned and bred by the Scottish member of the Northern Goldfish & Pondkeepers Society, Alex King. Here he is receiving both awards from the Nationwide Chairman Sherridan Moores. There were 166 entries in the 63 Classes all judged to the Nationwide Goldfish Standards UK. The judges were Bill Ramsden (Bill is President of the NGPS and is now 91 years old — still attending and judging Goldfish), Sherridan Moores, Dean Roberts, Andy Barton, Marty Clare, and the above Alex King representing the four clubs in Nationwide UK. The auction was run by Mick Smith with 57 lots of home bred fancy goldfish, most of which sold for just a few pounds. Sponsors included Aquarian, FishScience, Biffa and Vitalis, so every First in each Class received a pack of their products. The beautiful tail of the Jikin. The First among the Ryukins. A Team of Four Nacreous Veiltails. This is the end of the year for the Nationwide Goldfish Shows, hope to see you visit all five shows that will take place in 2018. See Practical Fishkeeping for where and when. Leg number seven of the countrywide competition to find the year’s best Guppy was held at the Open Show of the Nationwide Goldfish Societies UK in Telford on September 30, 2017. The Best Pairs was a Delta tail Albino Red by Steve Elliott, which is pictured above. October 5–8, 2017 at the Holiday Inn Express, Rockingham Road, Kettering, NN14 1UD. Terry and Shirley Nelson's show winning cichlid. The annual Open Show and Auction by SVAS (Sheaf Valley Aquarist Society) took place at The Rockingham Centre at Hoyland Common, Barnsley on Sunday, September 24. Two of the top aquarists in the country won the ‘Best in Show’ and ‘Best Exhibit’ awards. The Best in Show Metriaclima lombardoi achieved 86.5 points. The owners are Terry and Shirley Nelson of Ashby Fishkeepers Society who are recently gained a special award for their 1000th show First — and that was just in the YAAS (Yorkshire Association of Aquarist Societies) area. Here is Shirley collecting the Award (Terry was busy de-benching). They have attended six Open Shows in Yorkshire this year and won Best in Show in five of them. The top aquarist from SLAS (Southend, Leigh & District Aquarist Society) is Roy Chapman who visited all the way from Southampton. He brought 36 entries to the 190 in the Open Show. Roy says he has lost count, but is certain the number of Firsts he has been awarded over the years is now more than 2,800! Another First was added with his Best Exhibit (top points for Pairs Class) — this colourful pair of Nannostomus marginatus pencilfish. Roy collects his Award from Steve Jones of YAAS. Many other Clubs attended and won Firsts in the 41 Classes — SVAS, Select, Ashby, Robin Hood, and Otley. The auction was attended by 80 visitors and ran all afternoon with SVAS member Wayne Morton selling 14 lots of fish and aquatic accessories. The SVAS offer space for the FGUK (Fancy Guppies in the UK) each year and the sixth Leg in their nationwide competition was held in the main hall at the Rockingham Centre. The FGUK judges assessing the 38 entries were Jane Handley, Stan Collinge and Bill Galbally. The Best in Show was a Full Red Delta Tail Guppy owned by Derrick Clayton of FGUK. The FGUK will hold their final event for the European Championship Show on October 5–8 2017 at the Holiday Inn Express, Rockingham Road, Kettering, NN14 1UD. See their website for more details. November issue of Practical Fishkeeping on sale now! The November 2017 issue of Practical Fishkeeping comes with a FREE 24-page guide to keeping marines. We offer a selection of tetras with more subtle colours to add contrast to your community aquarium; snakeheads are our fish of the month — find out why these beautiful fish are worth fighting for; be dazzled by the amazing colours of the Micro Lord corals; discover the Tamasaba goldfish — a fancy that you can even keep in your pond year-round; we go back to basics with growing aquariums plants; 25 aquarium pumps on test; our diploma series looks at filtration — plus much, much more. Order your November copy today for free first class delivery to your home. Or why not subscribe to the magazine? Check out our latest subscription offer and save yourself money! Could you be the next Editor of Practical Fishkeeping? We're looking for a new Editor. Could it be you? Fancy one of the best jobs in fishkeeping? Practical Fishkeeping magazine is looking for a new editor! As the UK’s best-selling fishkeeping magazine, Practical Fishkeeping is an essential read for anyone with an interest in fish, whether tropical, coldwater, marine or pond. It's the first port of call for in-depth information on the fish to choose and how to care for them, along with inspirational ideas, step by step guides, product reviews and advice from the world’s top experts. As editor you will have a compelling vision for all channels of the Practical Fishkeeping brand, along with an interest in fish, the fishkeeping community and the industry that supports them. You will be able to demonstrate brilliant magazine craft, meticulous attention to detail and the ability to inspire a small, highly creative team to even greater achievements. Generations of goldfish at Northern show! congratulates seven-year-old junior member Millie Clinton on a First win at their annual Open Show. The Northern Goldfish & Pondkeepers Society held its annual Open Show on Saturday, September 16 at St Matthews Church Hall in Stretford, Manchester, reports Dr David Ford. This event includes an auction of home-bred fancy goldfish as well as a competition with 76 Classes of Goldfish, from the Common to the Bubble-eye (pictured above), which is the one Millie collected that award for…. There were 160 entries in the competition. Best in Show was a London Shubunkin bred by NGPS member Alan Ratcliffe. lecture by NGPS Vice-president David Ford on ‘The History of the Aquarium’. Goldfish at Horsehay Village Hall, Bridge Road, Horsehay, Telford TF4 2NF.